Posted February 5, 2019 under Ask Us. Thanks for your question. Trichotillomania is also called the “hair pulling disorder”. 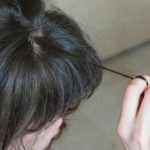 People with this condition have a strong, uncontrollable urge to pull out their own hair from their head or other areas of their body such as their eyelashes, eyebrows, arms, legs, and pubic area. Trichotillomania can affect guys and girls and people of any age, but it usually begins during adolescence. Simply stopping this habit is not easy and requires the help of a medical provider and counselor who have experience treating patients with this condition. Treatment is usually a combination of medicine and behavior therapy. Having the support of family and friends is also a very important part of the treatment plan. It sounds like your mom doesn’t completely understand what trichotillomania is and why you just can’t stop pulling your hair out. That’s why it’s important to talk to your health care provider who might be able to explain more about the condition and offer help. Not everyone is aware that they have trichotillomania, so the fact that you know will help you advocate for yourself. It’s important to know that it is not your fault, and you are not alone. There are organizations that can offer information and support.